Afghan President Ashraf Ghani says more than 45,000 members of the country’s security forces have been killed since he became leader in 2014. The figure is far higher than previously thought, with Mr Ghani saying late last year that 28,000 had been killed since 2015. His comments come amid top-level talks between US and Taliban representatives. The Taliban, the main insurgent group in Afghanistan, said on Thursday that they had held four days of face-to-face talks with US officials seeking to end 17 years of war. It is not clear if the talks have continued into Friday, but earlier reports said negotiators were progressing towards a deal. “Since I’ve become president… over 45,000 Afghan security personnel have paid the ultimate sacrifice,” Mr Ghani said at the World Economic Forum in Davos, Switzerland. We need to get a stable Afghanistan that can ensure the security of Americans, Europeans, and others on the one hand, but more fundamentally our own democratic rights and institutions,” he added. Mr Ghani’s decision to reveal new death toll figures is unusual. The Taliban frequently carry out deadly attacks targeting military bases, soldiers and policeand in recent years US and Afghan officials have withheld detailed casualty figures as they are deemed too sensitive. It’s a staggering casualty figure – nearly 30 deaths a day – for any military. 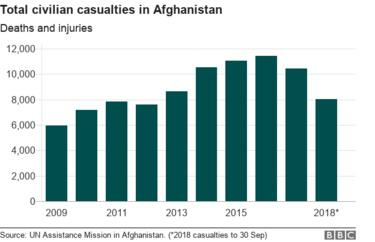 A record number of Afghan police and troops have been killed since most international combat troops withdrew from the country by the end of 2014. The admission from Mr Ghani came during a bad week for the forces. Afghan officials may justify the high casualty rate, saying they are now doing most of the fighting – not the international forces. But many analysts have described the current death rate as unsustainable and utterly demoralising for the Afghan military. Military observers say that Afghan soldiers are spread too thin on the ground and the Taliban exploit this by attacking isolated posts, check points and bases with ferocity. The Taliban feel that the momentum is on their side, and that’s why they are talking to the US, but refusing to engage with the Kabul government. The US/Nato-backed military is struggling to cope, and attacks are becoming more frequent and much deadlier. Large parts of provinces like Helmand and Kandahar – where hundreds of US, UK and other foreign troops were killed – are now under Taliban control. Meanwhile, civilian casualties are at an unprecedented level. According to the UN, more than 10,000 civilians were killed or injured in 2017.